by Kenneth Arnold America You Should be Ashamed! On the cover of this magazine you will find the title, FATE, which is perhaps the most significant, most dominant word the world has ever known. It has been the basis for innumerable dogmatic religions, for stultifying superstitions, for lack of progress through despair and hopelessness. At the same time it has brought into the open the highest courage of body and soul, been the foundation of rigid discipline that has established great nations and conquered others as great, and drawn man’s eyes toward the inexpressible mystery of an all-powerful Creator. Because of its relationship to these things, this magazine has been called FATE. FATE is a new kind of magazine. It was conceived several years ago, vaguely and imperfectly in the minds of its editors. Through the intervening years of research, study, experience, analysis, debate, planning, and just plain hard work, the concept went on, until today it lies in your hands, a modest, but energetic young magazine dedicated to the earnest, thinking people of all races and walks of life. It is a magazine devoted to the defense of reason. It is a bringing out into the open of the real kinship between fate and free will. It is a magazine dedicated to the scientific method, to calm analysis of the known and the unknown. It is a magazine for the logical man, the religious man, for the doubtful man, for the observing man, and above all, for the man who wants to know the answers to those greatest of all questions: Why was I born? Where am I going? Who, and what, am I? You might call FATE a “cosmic reporter.” Its real purpose is reporting the unbiased truth. FATE is your instrument for gathering news more important than the things the immortal Will Rogers used to “read in the newspapers” and claimed was “all I know.” Will Rogers knew a great deal more than what he read in the newspapers. He knew, for instance: A man’s what he wants to be - and who can he blame for that! His philosophy of life put the superstitious, dogmatic type of fate right where it belonged. He knew, too, that God didn’t put him here to “just sit.” He realized man was a “master of his fate, captain of his soul” and ought to do something constructive about it. FATE lets you do your own thinking, confining its efforts solely to supplying the material upon which your ability to think can be directed, with the ultimate decision your own. Your own decision is the correct one! That’s what the fates really mean to you. The fates never make a move until you decide their course. What happens after that is pre-ordained, but not by those silly old ladies who are supposed to be using you for dice. Now do you know how FATE is a new kind of magazine? Can you see how it is intended to be a help to you in your daily life? It isn’t just “another magazine” intended to entertain, although FATE can emphatically state that no other magazine will top its contents for drama, plot, intrigue, characterization and adventure! It isn’t a fiction magazine containing stories, but a factual magazine containing articles by experts in all walks of life and by others not so expert, but having something dynamic, significant and truthful to say! The following story of what I observed over the Cascade mountains, as impossible as it may seem, is positively true. I never asked nor wanted any notoriety for just accidentally being in the right spot at the right time to observe what I did. I reported something that I know any pilot would have reported. I don’t think that in any way my observation was due to sensitivity of eyesight or judgment other than what is considered normal for any pilot. The air was so smooth that day that it was a real pleasure flying and, as most pilots do when the air is smooth and they are flying at a higher altitude, I trimmed out my airplane in the direction of Yakima, Washington, which was almost directly east of my position, and simply sat in my plane observing the sky and terrain. There was a DC-4 to the left and to the rear of me approximately fifteen miles distant and, I should judge, at 14,000 feet elevation. The sky and air were as clear as crystal. I had not flown more than two or three minutes on my course when a bright flash reflected on my airplane. It startled me as I thought I was too close to some other aircraft. I looked every place in the sky and couldn’t find where the reflection had come from until I looked to the left and the north of Mt. Rainier where I observed a chain of nine peculiar-looking aircraft flying from north to south at approximately 9,500 feet elevation and going, seemingly, in a definite direction of about 170 degrees north to south. They were approaching Mt. Rainier very rapidly, and I merely assumed they were jet planes. Anyhow, I discovered that this was where the reflection had come from, as two or three of them every few seconds would dip or change their course slightly, just enough for the sun to strike them at an angle that reflected brightly in my eyes. I thought it was very peculiar that I couldn’t find their tails, but assumed they were some new type of jet. I was determined to clock their speed. I had two definite points - Mt. Rainier and Mt. Adams - to clock them by, and the air was so clear that it was very easy to see the objects and determine their approximate shape and size as far as fifty miles. I remember distinctly that my sweep-second hand on my eight-day clock, which is located on my instrument panel, read one minute to 3 P.M. as the first object of this formation passed the southern edge of Mt. Rainier. I watched these objects with great interest as I had never before observed airplanes flying so close to the mountain tops, flying directly south to southeast down the hog’s back of a mountain range. I would estimate their elevation could have varied a thousand feet one way or another up or down, but they were pretty much on the horizon to me which would indicate they were near the same elevation as I was. They flew, as I have frequently observed geese fly, in a rather diagonal chain-like line as if they were linked together. They seemed to hold a definite direction, but swerved in and out of the high mountain peaks. Their seed at the time did not impress me particularly, because I knew that our army and air forces had planes that went very fast. What kept bothering me as I watched them flip and flash in the sun right along their path was the fact that I couldn’t make out any tail on them, and I am sure that any pilot would justify more than a second look at such a plane. I observed them quite plainly, and I estimate my distance from them, which was almost at right angles, to be between twenty to twenty-five miles. I knew they must be very large to permit me to observe their shape at that distance, even as clear a day as it was. In fact, I compared a zeus fastener or cowling tool I had in my pocket with them, holding it up on them and holding it up on the DC-4 that I could observe at quite a distance to my left, and they seemed smaller than the DC-4; but I should judge their span would have been as wide as the farthest engines on each side of the fuselage of the DC-4. The more I observed these objects, the more upset I became, as I am accustomed and familiar with most all flying objects whether I am close to the ground or at higher altitudes. I observed the chain of these objects passing another high snow-covered ridge in between Mt. Rainier and Mt. Adams, and as the first one was passing the south crest of this ridge the last object was entering the northern crest of the ridge. As I was flying in the direction of this particular ridge, I measured it and found it to be approximately five miles, so I could safely assume that the chain of these saucer-like objects was at least five miles long. I could quite accurately determine their pathway due to the fact that there were several of them as well as higher peaks on the other side of their pathway. As the last unit of this formation passed the northernmost high snow-covered crest of Mt. Adams, I looked at my sweep-second hand and it showed that they had traveled the distance in one minute and forty-two seconds. Even at the time this timing did not upset me as I felt confident that after I landed there would be some explanation of what I had seen. A number of news men and experts suggested that I might have been seeing reflections or even a mirage. This I know to be absolutely false, as I observed these objects not only through the glass of my airplane but turned my airplane sideways where I could open my window and observe them with a completely unobstructed view. Even though two minutes seems like a very short time to one on the ground, in the air in two minutes’ time a pilot can observe a great many things and anything within his field of vision probably as many as fifty or sixty times. I continued my search for the Marine plane, for another fifteen or twenty minutes, and while searching for this Marine plane the things I had just observed kept going through my mind. I became more disturbed, so after taking a last look at Teton Reservoir I headed for Yakima. I might add that my complete observation of these objects, which I could even follow by their flashes as they passed Mt. Adams, was around two and one-half or three minutes - although by the time they reached Mt. Adams they were out of my range of vision as far as determining shape or form. Of course, when the sun reflected from one or two or three of these units, they appeared to be completely round; but, I am making a drawing to the best of my ability, which I am including, as to the shape I observed these objects to be as they passed the snow-covered ridges at Mt. Rainier. When these objects were flying approximately straight and level, they were just a thin black line and the only time I could get a judgment as to their size was when they flipped. These objects were holding an almost constant elevation; they did not seem to be going up or to be coming down, such as would be the case of rockets or artillery shells. I am convinced in my own mind that they were some type of airplane, even though they did not conform with the many aspects of the conventional type of planes that I know. Although these objects have been reported by many other observers throughout the United States, there have been six or seven other accounts written by some of these observers that I can truthfully say must have observed the same thing that I did; particularly, the descriptions of the three Western Air Lines employees of Cedar City, Utah, the pilot from Oklahoma City, the locomotive engineer in Illinois, John Corlett, a United Press correspondent of Boise, Idaho. Dave Johnson, news editor at the Boise Daily Statesman, Captain Smith, a co-pilot Stevens and Marty Morrow of United Air Lines, and Captain Charles F. Gebian and Jack Harvey of United Air Lines both of whom on July 28, 1947, made their observation on United Air Lines flight 105 westbound out of Boise. It is my opinion that descriptions could not be very accurate taken from the ground unless these saucer-like discs were at quite a great height and there is a possibility that all of the people who observed peculiar objects could have seen the same thing I did; but, it would have been very difficult from the ground to observe these for more than four or five seconds, and there is always the possibility of atmospheric moisture and dust near the ground which could distort one’s vision while air observers I would judge to be much more accurate. I have in my possession letters from all over the United States and Europe from people who profess that these objects have been observed over other portions of the world, principally Sweden, Bermuda, and California. I would have given almost anything that day to have had a movie camera with a telephoto lens and from now on I will never be without one. When I landed at Yakima, Washington airport I described what I had seen to my very good friend, Al Baxter, who is the General Manager of Central Aircraft Company. He listened patiently and was very courteous but in a joking way didn’t believe me. I did not accurately measure the distance between these two mountains until I landed at Pendleton, Oregon, that same day where I told a number of pilot friends of mine what I had observed and they did not scoff or laugh, but suggested they might be guided missiles or something new. In fact, several former Army pilots informed me that they had been briefed before going into combat overseas that they might see objects of similar shape and design that I described and assured me that I wasn’t dreaming or going crazy. Anyhow, the news that I had observed these spread very rapidly and before the night was over I was receiving telephone calls from all parts of the world; and to date I have not received one telephone call or one letter of scoffing or disbelief. The only disbelief that I know of was what was printed in the papers. I look at this whole affair as not something funny as some people have made it out to be. To me it is mighty serious and since I evidently did observe something that at least Mr. John Doe on the street corner or Pete Andrews on the ranch has never heard about, is no reason that it does not exist. Even though I openly invited an investigation by the Army and the FBI as to the authenticity of my story or a mental and physical examination as to my capabilities, I received no interest from these two important protective forces of our country until two weeks after my observation. I will go so far as to assume that if our Military Intelligence was not aware of what I observed and reported to the United and Associated Press and over the radio on two different occasions which apparently set the nation buzzing, they would be the very first people I could expect as visitors. I have received lots of requests from people who told me to make a lot of wild guesses. I have based what I have written here in this article on positive facts and as far as guessing what it was I observed, it is just as much a mystery to me as it is to the rest of the world. I saw them and I know they are real. My pilot’s license is 33489. I fly a Callair airplane, which is a three-place single-engine land ship that is designed and manufactured at Afton, Wyoming, as an extremely high-performance, high-altitude airplane that was made for mountain work. The national certificate of my plane is NC-33355. 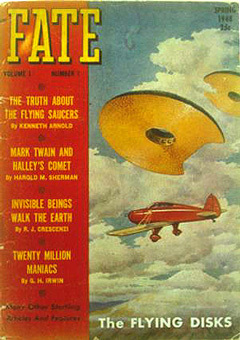 All material copyright FATE magazine. redistributed without the express written consent of FATE magazine.